Linkage disequilibrium is the condition in which the haplotype frequencies in a population deviate from the values they would have if the genes at each locus were combined at random. When there is no such deviation, when linkage disequilibrium = 0, then the population is said to be in linkage equilibrium. 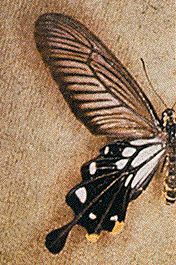 The butterfly Papilio memnon (pictured opposite) is an example of high linkage disequilibrium. How do we calculate linkage disequilibrium?